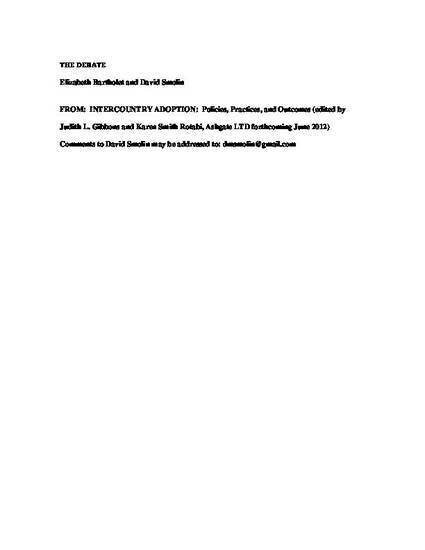 This chapter is taken from a forthcoming book on Intercountry Adoption, edited by Judith L. Gibbons and Karen Smith Robati and forthcoming in June of 2012. The chapter constitutes a debate between Professor Elizabeth Bartholet and Professor David Smolin. Each independently was given three questions to answer, and then one opportunity to respond to the other's answers to those three questions, all with strict space limitations. The debate illustrates some of the starkly different perspectives regarding the law, policies, and facts relevant to intercountry adoption. Chapter taken from Intercountry Adoption: Policies, Practices, and Outcomes (Ashgate; edited by Judith L. Gibbons & Karen Smith Rotabi, forthcoming June 2012).